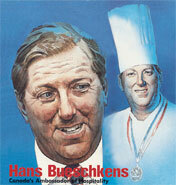 Hans J. Bueschkens, was President of WACS from 1980 to 1988. Born in Cologne in Germany in 1931, he began his career at the age of 14 as an apprentice. At the age of 20, he left Germany to emigrate to Canada and worked as chef on a passenger liner. Later, he became active in the Canadian Federation of Chefs de Cuisine (CFCC). He headed the first official CFCC Team Canada at the 1972 Culinary Olympics in Frankfurt, Germany, which came up with a highly-respected fourth place. In 1976 Canada placed second behind the Swiss. In 1980 Bueschkens was elected President of WACS and was reelected in 1984 to a second four year term, the first consecutive reelection in the history of WACS. When he assumed the presidency it represented about 210,000 members in 23 countries and grew to more than 1.8 million members in 51 countries. Bueschkens declared as his primary goals: the creation of a multi-continent WACS as a truly world-wide society by attracting more countries as members; and to create programs to interest youth by bringing junior chefs into WACS activities. Thus, he played a key role in the Taste of Canada World Student Chefs Olympics as well as the World Junior Chefs Challenge held in South Africa, the WACS-endorsed World Junior Grand Prix 2003 and last but not least the Hans Bueschkens Junior Chefs Challenge, first hosted in Kyoto, Japan in 1992 and continued in Dublin, Ireland in 2004, Auckland, New Zealand in 2006 and in Dubai in 2008. Well deserved honours and accolades have followed Bueschkens the greater part of his life. Bueschkens died suddenly of a heart attack in Basel, Switzerland on September 8, 1996. We will remember him as a great chef and a man with great passion and commitment..